Before one shot was fired, already bleeding. No IEDs to snag their careless feet. A Black Hawk hovered overhead. For farmers, now each preparing one grenade. Heaney’s original is ‘Anahorish 1944’ p7 in ‘District and Circle’ published by Faber & Faber 2006. 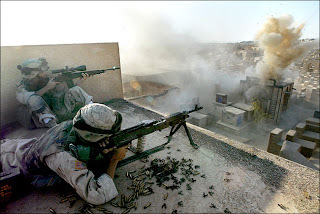 The picture is of US troops engaged in a fire fight in a cemetery in An Najaf. A spokesman later claimed that when it was over 'many dead enemy combatants were discovered in the area'.